Digital information has quickly become the lifeblood of business success, enabling firms to become more operationally efficient and to better serve their customers. As companies seek to harness their data in new ways, the infrastructure that houses that data can falter under the strain. In response, new innovations have emerged to help address the concerns of managing and protecting these increasingly important data capacities. 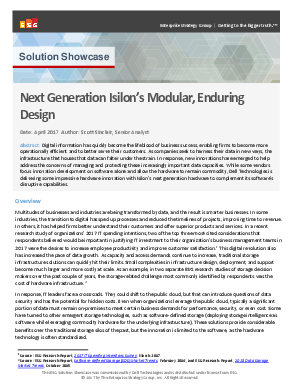 While some vendors focus innovation development on software alone and allow the hardware to remain commodity, Dell Technologies is delivering some impressive hardware innovation with Isilon’s next generation hardware to complement its software’s disruptive capabilities. Download this white paper from Dell EMC and Intel® to learn more.